I’m adding Scarlett O’Hara to my list of favorite heroines (Jane Eyre, Elizabeth Bennet, Lily Bart, Dolores Price, Anne Elliot, Summer Royall, and Scarlett O’Hara). I don’t think Scarlett even knows. I finally got around to reading Margaret Mitchell’s, Gone with the Wind, and had some thoughts on the character of Scarlett O’Hara. She’s a heroine (although not terribly likable) to be sure, but very complicated. She continually questions her own identity: Scarlett O’Hara, a widow? Scarlett O’Hara in rags? Scarlett O’Hara picking cotton? Scarlett O’Hara, a wife and mother? Scarlett, you’re part Ellen O’Hara (hearing this would make her elated as she longs to be just like her mother), you’re part Gerald (upon hearing this she’d squirm in her chair a bit, then she’d remember the Gerald-of-old, and think it quite a valid observation), and you’re part Rhett Butler. Upon hearing this, she’d leave the room with a Fiddle-dee-dee screw you! Because, this part of Scarlett’s character is the part she absolutely refuses to recognize. She’s like Ellen in her efficient administration and organizational skills. She also longs to be like her morally…but we (the readers) know this will never ever happen. She shares Ellen’s rather twisted and immature view of love as well. (Ellen, on her deathbed cries out for Philippe, not Gerald. After all Gerald has given her…she still cries out for Philippe. He’s sort of her very own Ashley Wilkes). 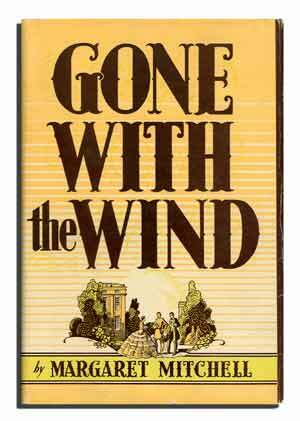 I must add that there is so much more to GWTW (the book) than GWTW (the movie). Don’t compare them. For instance, if you’re wondering, “Who the heck is Philippe?” then basically…you need to read the book. Scarlett is like Gerald (“Pa”) in her love for the land. She holds tightly to the red earth that Ashley places in her palm. She has Gerald’s “no one is going to lick me,” attitude, and she longs for Tara and all Tara holds (the landscape, the house, the pines along the path) like a thirsty body longs for water. Also, her hot Irish temper tells the reader that she is without a doubt, Gerald’s daughter. Rhett Butler relays to Scarlett numerous times that they are in fact alike, but she refuses to accept it. It’s so obvious to the reader though. They both spot the truth from day one — that war is an awful waste of time and something to be avoided at all costs; they both are selfish; they both want to enjoy life. But she refuses to accept his observation in their likeness just as she refuses to accept his love. It isn’t until he finally leaves her that she feels a void. Because Rhett was really a part of Scarlett, in my opinion. Scarlett has her moment of self-discovery, only after losing the part of herself that she refused to recognize….the Rhett Butler part. You won’t be surprised to hear me say this, but I think she’s also part Undine Spragg, from The Custom of the Country…. I so agree with you about Undine Spragg — particularly when it comes to motherhood! Completely true! I also read GWTW quite recently and loved it. Amazing how 1,000 pages can fly by so quickly. I didn’t understand Scarlett until I read her a second time when I was in my 40s. Then I saw her quite differently. I think she gets a bad rap from too many. She has the stuff women are made from and made mistakes along the way as most of us do. Thanks for stopping by PurpleStone blog. I like your posts. I agree. So many other people depended on her. She had no one to really lean on during the toughest of times. Very insightful analysis, and I don’t even know who Undine Spragg is so I’d better get on the ball!